Rejoice always, pray without ceasing. Give thanks in all circumstances; for this is the will of God in Christ Jesus for you. Do not quench the spirit. Do not despise the words of prophets, but test everything; hold fast to what is good; abstain from every form of evil. May the god of peace himself sanctify you entirely and may your spirit and soul and body be kept sound and blameless at the coming of our Lord Jesus Christ. The one who calls you is faithful and he will do this. When I hear the word Christmas, the first image that comes to my mind or first emotion or the first thing that comes to my mind is joy. Joy characterize Christmas: bright lights, cheerful Christmas carols; some radio stations if you turn it on, they play all day Christmas carols from December. I love that, and the joy of giving gifts and receiving gifts, parties and good food. Christmas is a season of joy. It symbolizes that life is good. It symbolizes the happiness of life, but the problem of the joy that we feel during Christmas is that it does not last too long. It is short lived. And when the lights are down, and when carol songs stop, and the bills of Christmas shopping and spending come in the mail and all we see is our weight gain we come back to our gloomy reality. That’s why February is the most depressing month of the year. In January at least there is a new beginning. And at least you have some hope that something is starting, but in February we have nothing, nothing to look forward to. So government was worried. They created a family a day long weekend and then, longterm, over university, already, they sensed the depression of students and also the suicide rate is pretty high. So they created a reading week in February. I guess the joy that we know is not something that lasts for a long time. The joy that we know is a very short lived experience or a feeling. Is joy just a momentary feeling and that’s about it? Do we have to keep creating our environment either buying things or having a party or listening to music or watching movies by doing all these things? Do we just keep doing things to have joy? Is there no such thing as everlasting joy? It’s just an instant, instantaneous and temporary, a momentary feeling. That’s about it, but when you look at the scripture, especially when you hear the word from St Paul, his joy was different from the joy that we know. Paul said, “rejoice always”. How can you rejoice always? There are times when you are depressed. There are times when you’re sad. There are times when you go through difficulties. How can you rejoice always? But Paul says, rejoice always. So, his understanding of joy was not a momentary or instantaneous thing. He always had it. Rejoice always. I want to think about what that joy looks like, not just during Christmas season, but also in February. Not just on bright sunny days, but also on gloomy, rainy days. Not just when I’m at the party, but when I’m alone at home. How can I have that joy? We read Paul’s words in a letter, his letter to the Thessalonians, “rejoice always”, but he talks about joy more in an emphatic way in Philippians rather than Thessalonians. In Philippians, he says, “I will say it again. Rejoice”. The whole book is about joy. Ironically, he wrote that letter from prison. He was in prison when he wrote it, but the prison system at that time was very different from the prison system right now. We at least have a legal process. But at that time, a lot of times there was no legal proceeding. If the guard said ‘kill him’, then he could be killed the next day. So he didn’t know. You’d expect more in that situation. He said, ‘rejoice, rejoice always’. I realized that the joy Paul is talking about, as well as other spiritual qualities too, did not come from circumstances, or the exciting atmosphere around him. He did not draw joy from outside. Somehow he had joy within him and then I realized that nothing in the world can produce or manufacture joy. Even food cannot produce joy to everyone. Some people enjoy food, but some people, even though it’s delicious food, they don’t even enjoy it. They don’t get joy out of it, so nothing in the world can produce or manufacture the everlasting joy. The joy that comes from our circumstances can make us more depressed. Actually, once those circumstances disappear, change. Joy is within us. In the Gospel John, there’s a very interesting, very strange kind of statement. It says, whoever believes in me, rivers of living water will flow from within them. Rivers, rivers of living, water flow from within you, and Jesus is talking about this holy spirit actually, but I realized that that is what joy looks like. It looks like rivers of living water flowing out of you. In your conscious or in your ecosystems, there’s a flow of living water and that is what joy looks like. It is a power of life. It brings vitality to our existence. It is the energy that boosts up otherwise tasteless existence. When joy touches it, everything comes alive because of the energy. It’s not just feeling and it’s not just emotion, but it’s an energy that is flowing within the us. So whenever this joy that is within us touches anything, it comes alive. It’s not just emotion, it’s not just a feeling, it is the energy that is flowing within you. That’s why he can rejoice always. That’s why we can rejoice always. And there’s another the aspect of this joy. When God created the world. God said, it is good. It is a satisfied joy, a satisfied smile. God created the heaven and earth and everything and then he saw it and he was satisfied and he enjoyed the creation. It is good. So I realized that joy, another aspect of joy is deep seeded satisfaction. It’s not just the energy that boosts up your existence, but it calms you. It gives you tremendous satisfaction. Okay, it is good. Life is good. Your life is completely in God’s hands. That awareness; you don’t need to worry about anything. When you have that sense, you can start enjoying your life rather than worrying about your life. Your taste buds come alive and so you can enjoy your food. Your ears are open and so you can enjoy your music. Your spirit is alive and so you can enjoy the divine presence. We need joy within us to enjoy life. I don’t think we need that much money to enjoy life, in truth. When we have joy within us, we can enjoy things that are not that extraordinary. When you’re joyful because of you have money, that’s great, but if you’re joyful, even though you don’t have much money, that is really good. That is what joy within us looks like. The joy that comes not from money, but from within, that gives energy and satisfaction. If you have reason to be joyful, that’s good, but if you are joyful, even when you’re sad, that is really good. After KSM service, one person came up to me and asked, “Moksanim, how can we be joyful when you’re sad? How can you be joyful when you’re sad?”. I think we can be joyful, even when we cry. Does it make sense? It doesn’t seem to make sense, but it seems to make sense somehow. I felt that. And that was what Saint Paul said in 2 Corinthians, this is what he said. Listen: ‘as sorrowful, yet always rejoicing; as poor, yet making many rich; as having nothing, yet possessing everything’ (2 Corinthians 6:10). That’s a spiritual secret, a spiritual truth. When we have joy even though we are sad, the joy doesn’t disappear because joy is not a feeling. Joy is not a feeling. The joy does not disappear even when we are hurt. The joy does not disappear even when we are hard pressed from all sides. The joy within us is always there. Do you know what the true characteristic of joy is? The joy within us is different from the joy that you get from circumstances. You know what the difference is? 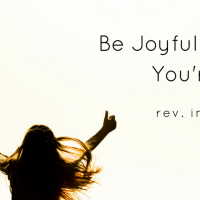 The true characteristic of joy within you? The joy within you makes others happy. That’s what the joy within you does. Joy within you makes other people joyful. The joy you get from the world makes you happy, but the joy the spirit gives within us, makes others happy. Making others joyful is my joy. Sometimes I get a reply for my inner voice. Whatever they got, whatever message they got from the inner voice, sometimes some people write a short reply to me. When I realized that something that I write that is very short touched their lives and made them joyful, that gives me tremendous joy. Making others happy is the best joy you can ever ask for. Making yourself happy, it’s not that great of a joy, but making others happy because of you gives you tremendous joy. Joy is contagious, trying to make other people joyful for when you’re not joyful, that’s hypocrisy or you’re a clown, but true joy is contagious. When I’m joyful, it makes people around me joyful. There are people like that. When they’re present, somehow the whole atmosphere comes alive. The whole place is like a new light comes in, and they make everything bright. But some people come in the dark. They make everything dark and gloomy. Wherever Jesus was, he made people happy. You know what? Jesus loved parties. He always went to a lot of parties. That’s why people accused him; ‘you’re drunkard and glutton!’. because he loved parties. When Jesus first called disciples, most of them were from John. You know John? John the baptist. He was in the wilderness. He had the camel’s clothes and he only ate wild honey. He lived a very ascetic life. So all the disciples followed John expecting that lifestyle and then John told them to follow Jesus, so they started following Jesus. Do you know the first place Jesus took these disciples to? It was not the mountain to pray, it was a wedding party and he enjoyed it and he taught them how to enjoy life. He taught them what joy looks like. The deeper your faith is, the deeper joy will flow out of you. Don’t try to influence other people by trying to change them. The best influence you can give to others is to make them happy and joyful, but often we make other people miserable. We make other people sad. We create so many problems for other people rather than making them happy and joyful. It’s our job to make others happy. In your family, it is your job to make your spouse and to make other people around you, to make your children happy. Don’t try to make other people miserable. That’s not the right thing to do. Make other people happy. If they’re happy because of you, thank God and praise God. Take joy wherever you go, take smiles wherever you go. Rejoice always. There will be people whose joy is restored because of your joy. When the deep seeded joy comes out from within us and becomes a song, that song will hit the joy that is hidden in others and their song will come out as a beautiful melody. That’s what joy is like. Joy is the best medicine. When we restore our joy, much of our illness will be healed. This world needs more joy. It’s too depressing, too gloomy. We need joy. Let us rejoice all our lives.